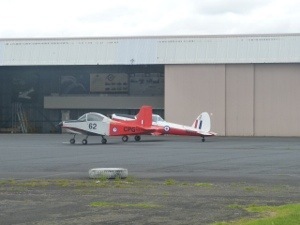 After a week at Waharau Regional Park we reluctantly left to head back to Auckland where we are now back at Ardmore Airport for the next few days. But first a quick wrap up and catch up on miscellaneous pictures from the last week or two. 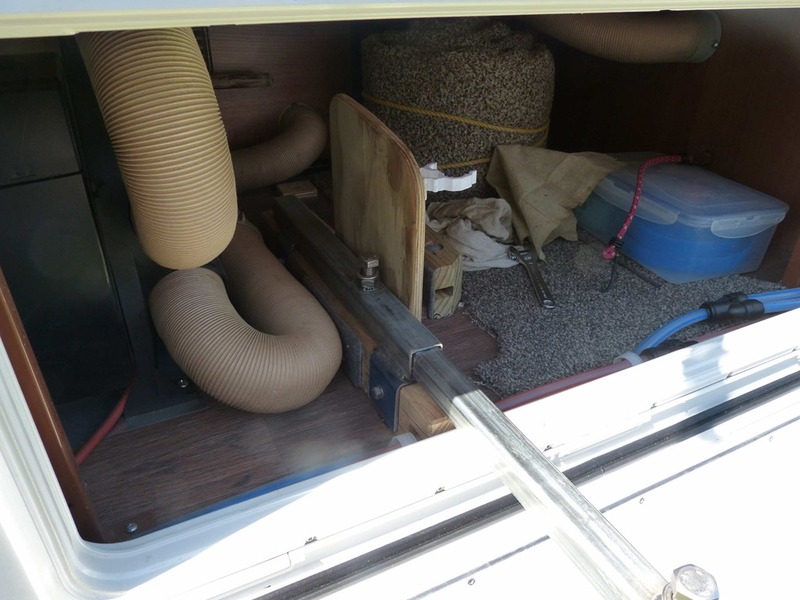 The first set of pictures are of a clever mounting system for a wringer that a fellow motorhomer had built. 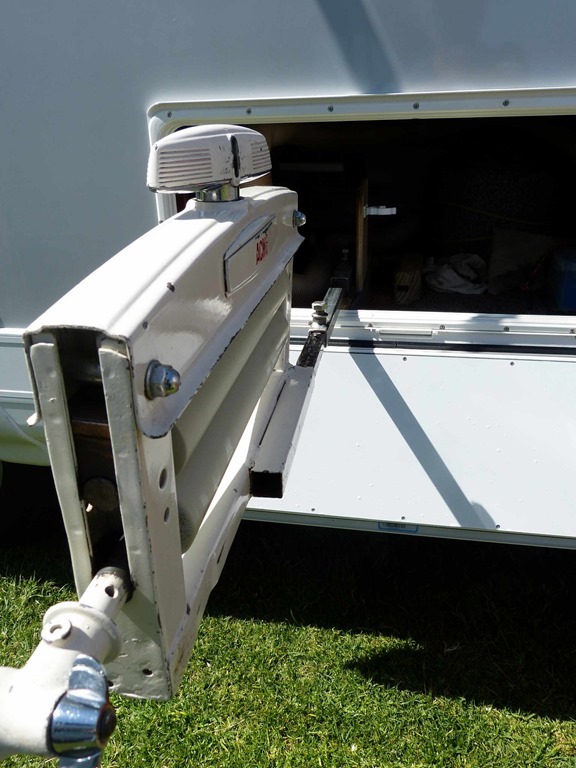 He had a set of box steel mounted inside a locker with the wringer also having a section of box steel welded onto it, with one set sliding onto the other, and a locking screw set in place. Now i have an idea of how I would like mine to be easily mounted, but not in a locker but on the rear bumper. watch this space for further developments. 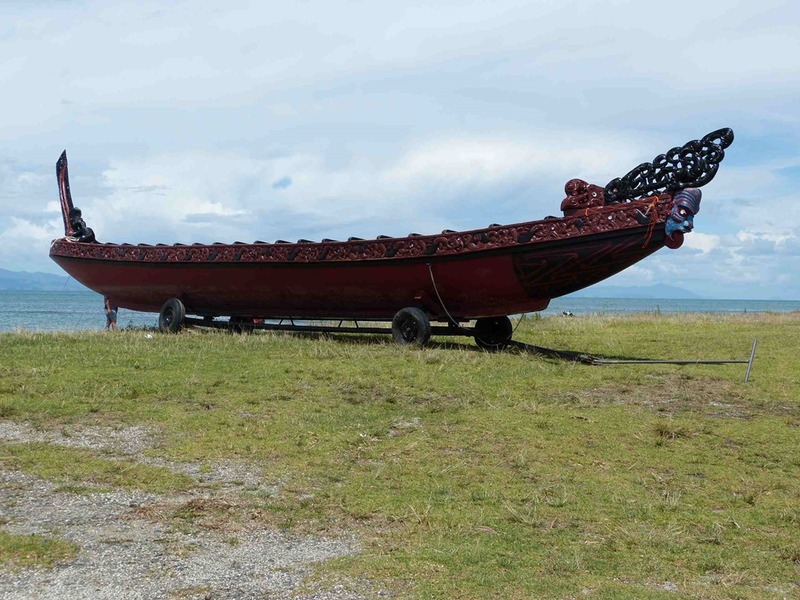 Another day and we headed off for a drive along the coast north of Kaiaua and came across this wonderfully carved waka (Maori Canoe). 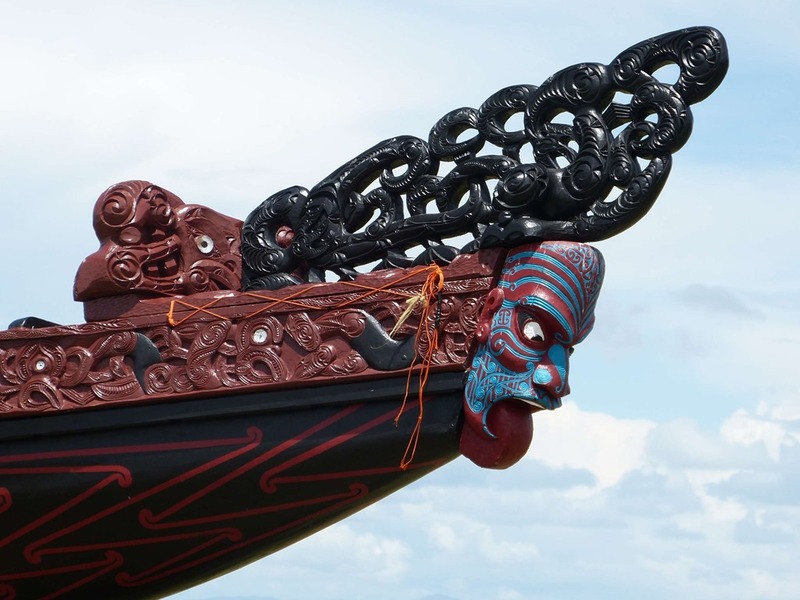 It would make a fabulous sight seeing it on the water, fully laden with paddlers. 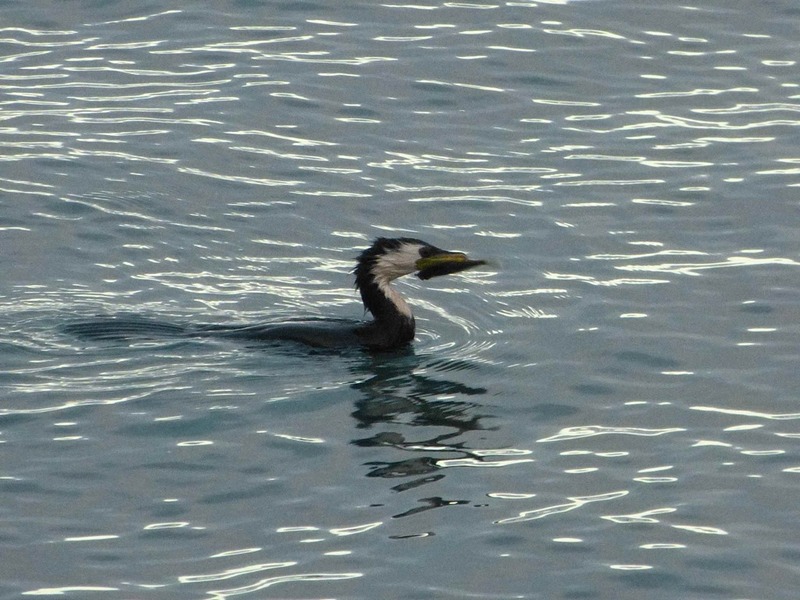 Another day and seen along the regular morning wanderings was this shag (aka cormorant in northern climes) with his breakfast catch. And yes, he did manage to swallow it all! 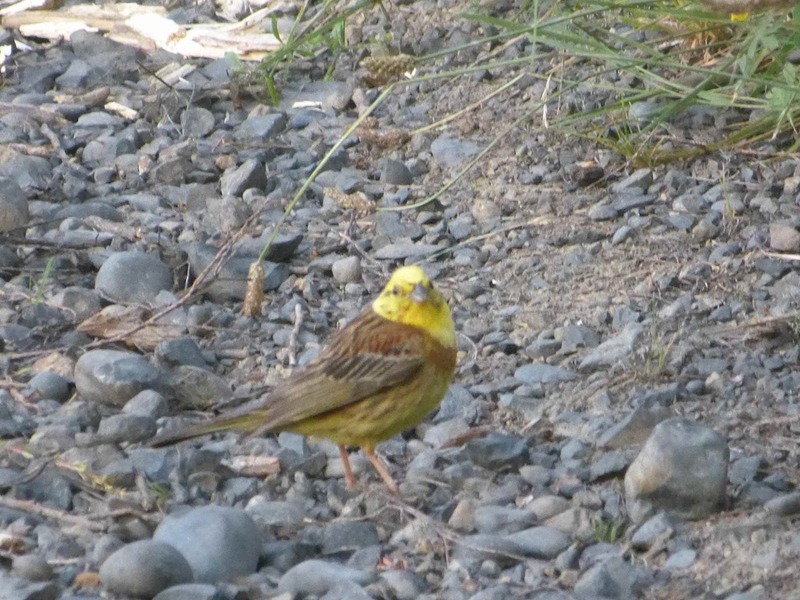 And this yellowhammer was seen along the creek at waharau. 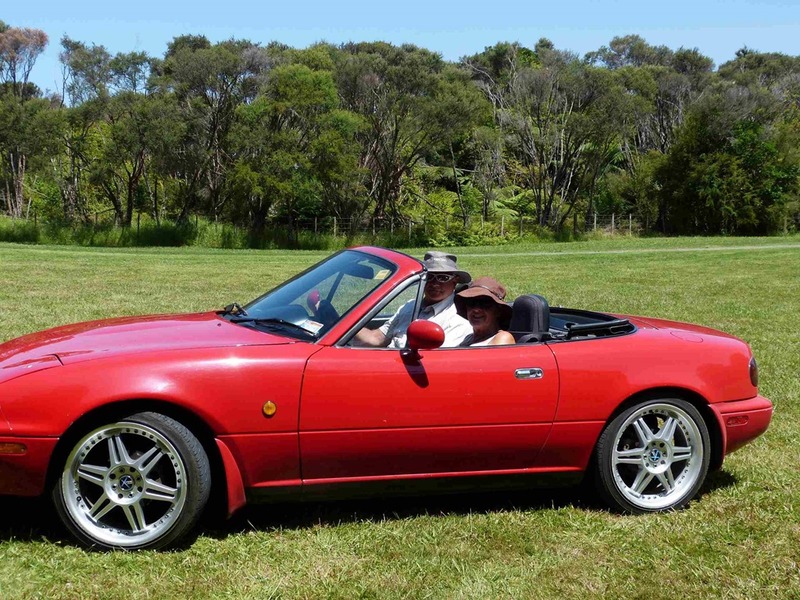 Whilst we were at Waharau, Bernice’s brother Steve and wife Leslie came for a visit, wanting to take their red sports car for a blatt they came to visit for the afternoon. Great to catch up and spend the afternoon with them and we look forward to spending some time with them in a couple of weeks when we join them in Whangamata for a long weekend. There was plenty to see and do around the Park, for two days we have the Army in on manoeuvres, however, every time we went past them we did not have a camera to hand. 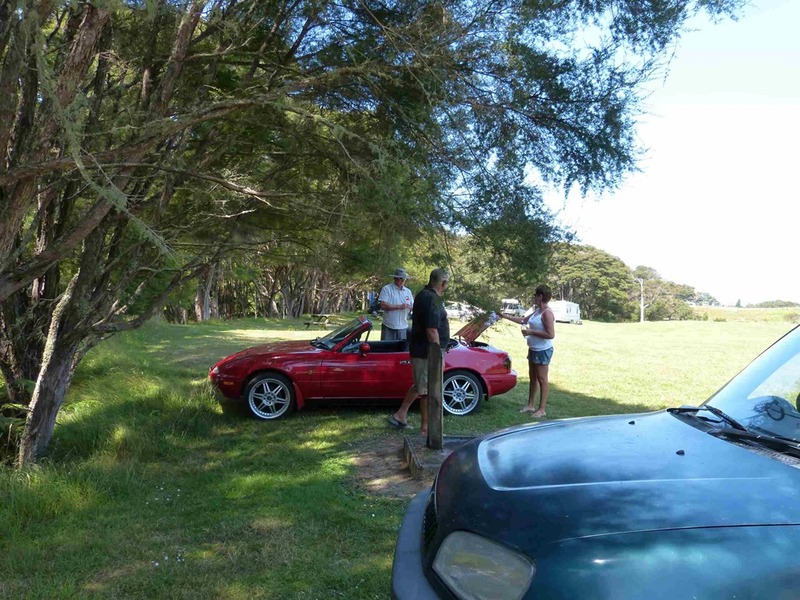 Nor did we take a camera, phone, iPad with us when we went for a drive to check out Orere Point and Tapapakanga Park. Never mind, I am sure we will return to take the obligatory pics. 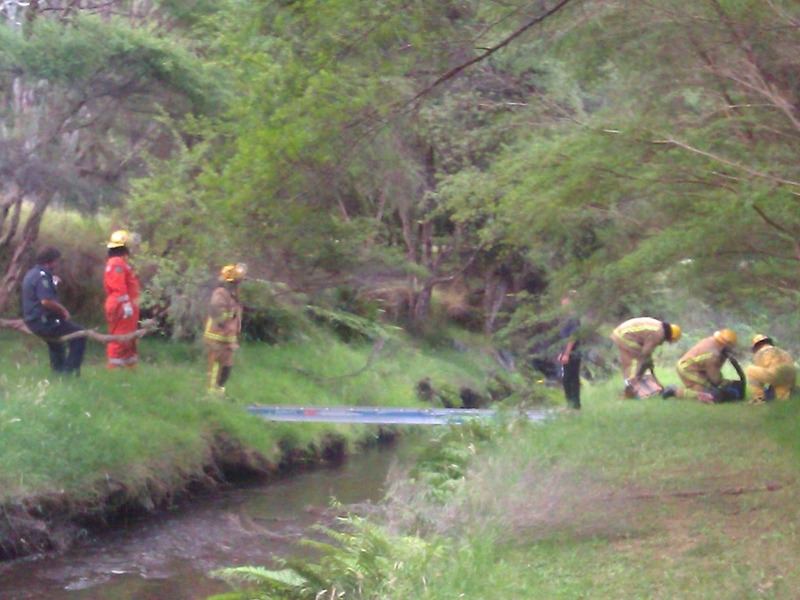 The local fire brigade were in the Park, just along from the Camping area, practising rescuing an injured person from across the creek providing us with some late afternoon entertainment. 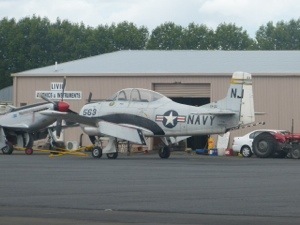 Now we are back parked up at Ardmore Airport, we are getting a few things done. Roy managed to break his denture plate (yet again), but this time he has not only had the plate repaired but is having a new plate made which means frequent visits to get it fitted, adjusted and made. As well, today he has had an MRI scan for his kidney (see When life throws you the curve ball ) and next week we will head to the specialist for the results. Fingers crossed. We are staying in the part of the park named Blackberry Flat, not that we have found any blackberries as yet, and basically have a large grassy area bordered by bush and a lovely stream to ourselves. 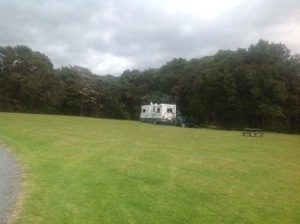 We intend to stay here for a week, enjoy the park, walks and beaches and generally check out the region. 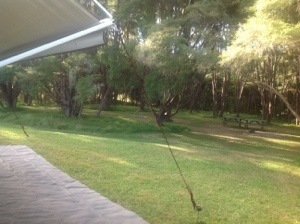 and to the picnic area. 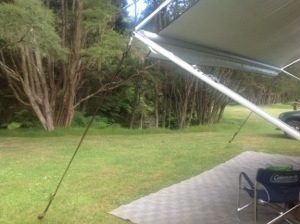 We have since moved one of the picnic tables to in front of the awning, where we can have our meals. Before we left Auckland, we managed to get most of our jobs done although I did not get a haircut, that can happen another day. We went to dinner with Jacky & Chris on Tuesday evening for the usual delicious meal accompanied by a very good wine from our cellar. Thanx also to Antony for the use of his washing machine before we left on Wednesday, which enable me to get the washing right up to date. 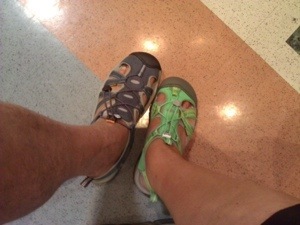 We also managed to find ourselves a new pair of Keens shoes each. These are fabulously comfortable shoes and we both already have a pair each which are very well used, we thought it was time for a new pair. Not only did we win raffles over the weekend, along with a small win in Lotto, we were also given a big bucket of luscious dark plums which I set to and made up a batch of deliciously spicy plum sauce. There were still plums left over so next on the to-make-list was an upside down plum cake which made not only one large cake but 6 muffin sized cakes as well, perfect for the freezer. Half the large cake was given to the organisers of the weekend rally as a thank you and the rest was later shared with Jacky & Chris. A visit to the Clevedon markets on Sunday morning and zucchini were purchased for the making of a delicious pickle, particularly loved by a certain daughter who will be visiting next month from London. 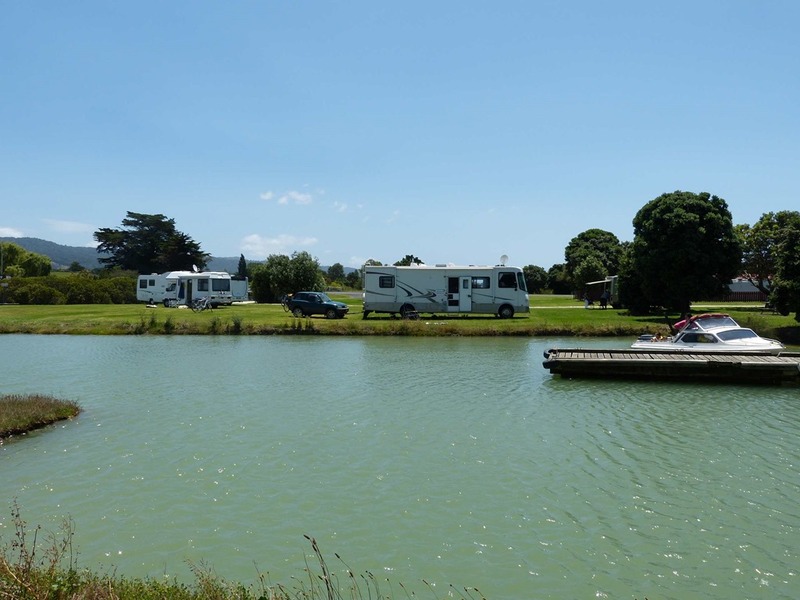 Time for us to leave Kawakawa Bay, we headed the short half hour drive over to Papakura where we are parked at the club for the next few days. Jacky & Chris came visiting sunday afternoon, washing was done at Antony’s, and a list of jobs was drawn up ready to tackle this week. Pickle is to be made, shopping for groceries and store cupboard items not readily available elsewhere is completed, doctors appointments organised, tests to be had, we even had our Tetanus/Diptheria immunisations done – ouch!, miscellaneous essential items purchased such as another anchor for our net and a new hat for Roy to replace the one that was blown away whilst he was fishing, oh and not to forget a much needed haircut. All going well, we should be on our way again by mid afternoon on Wednesday. 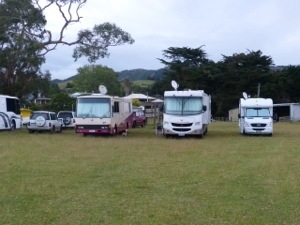 Our neighbors at Ray’s Rest were a group of very friendly folk who all happened to be part of the committee of the Counties Manukau branch of the NZ Motor caravan Association (NZMCA), they were all heading to a rally to be held just 30kms away at Kawakawa Bay, also not too far from Auckland. They asked us to come along and join in on a relaxed weekend of minimal organization, getting to know people and generally socializing. We were running low on fresh water and with no sign of rain in sight we knew we would have to find somewhere to fill up sooner or later. Friday we packed up and headed north again. 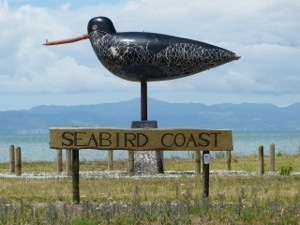 Before leaving Kaiaua we took a photo of the oyster catcher which welcomes you to this part of the world. 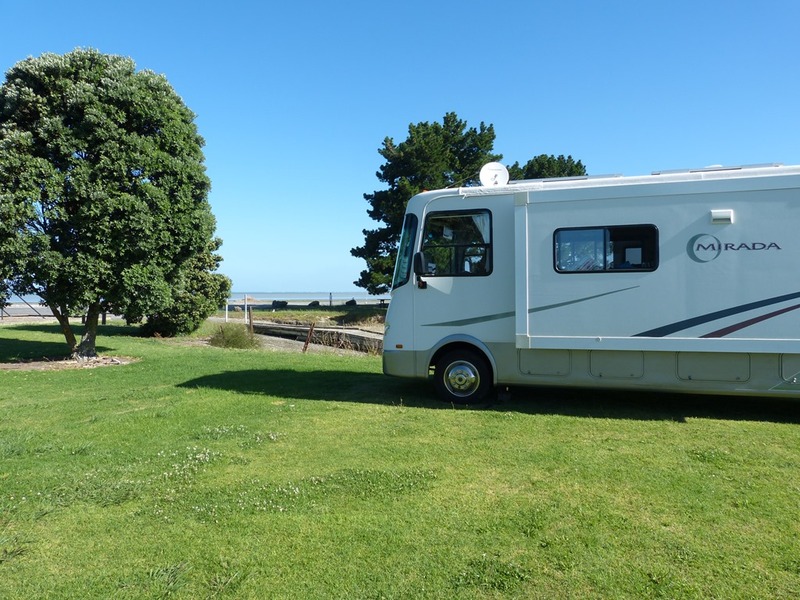 We arrived at Kawakawa Bay, which is located at the northern end of the western side of the Firth of Thames, in good time and were soon parked up. and the other side of the field. 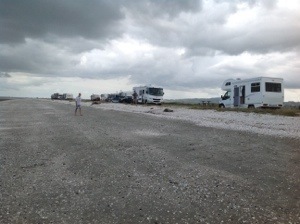 and there we are, parked up amongst 50 vans of all shapes and sizes. 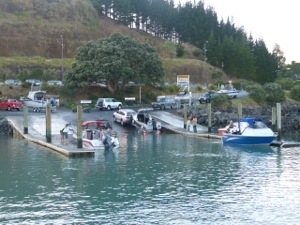 There also happened to be a local fishing competition on this weekend with a constant stream of boats going past all day to the boast ramp located at the end of the bay. 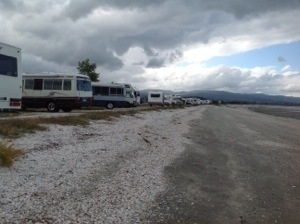 the boat ramp was a very busy place to be. The rally was a great success, and was exactly as we expected it to be, a fairly relaxed affair but plenty of opportunity to meet new people. Everyone was so very friendly and welcoming toward us and we came away having made some new friends whom we look forward to meeting up with on the road somewhere in the near future. 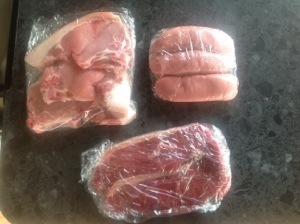 It also helped that we won three raffles over the weekend, two cash prizes and one meat tray. the obligatory sausages along with some lovely pork and some steak. 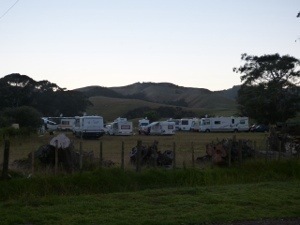 Not only that, we came away with the prize for travelling the greatest distance from our home base….as we are still members of the South Canterbury branch of the NZMCA we won the prize! note to selves – change “home” to no fixed address!!! 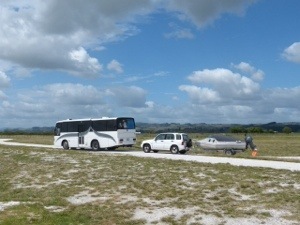 We had not been parked for very long at Kaiaua before a couple more vehicles arrived. Nothing strange about that, except for what these buses were towing. Roy does not need to be given any more ideas thanks, but I thought that these two were bound to result in a little bit of ‘discussion’…..
a bus towing a car, towing a boat! 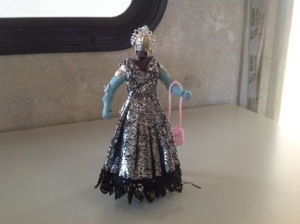 Hmmm, he thinks this could be a goer! no dear, you cannot have one! But how many men does it take to get it on its way? After talking to Ray’s wife Sue, it seems that Ray is a very clever man who likes building things. 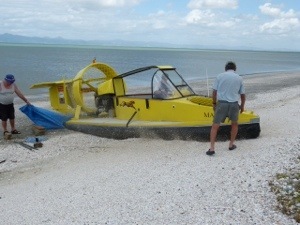 After his last project (he built their bus), he wanted to build a small plane, however Sue said she was not happy with that so Ray then came up with the idea to build a hovercraft. 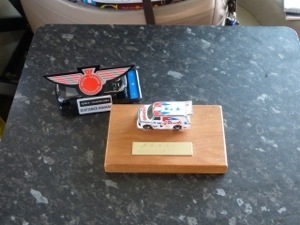 Plans were found, a motor sourced and off he set to build the hovercraft and this is the result. 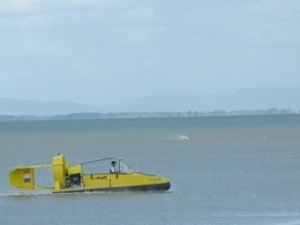 This was its first outing on water, although he had tested it out on a paddock and small pond this was going to be its inaugural launching. Away he went and not only did it race along, he tells us it got it up to 120kms/hr, it sounded very impressive. However, his plans to fly are not all lost as apparently there are wings which attach to the side of the machine and he is in the process of building them. 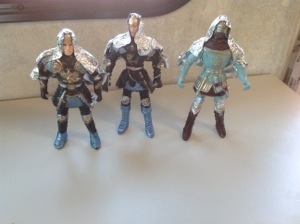 Now we hope that we are close by when he takes to the skies, and no Roy, you cannot have one of those either! We said in the previous post that we would explain our unscheduled stop when supposedly exiting Kaiaua. Whilst we were parked at. Ray’s Rest there were lots of people fishing with nets, we watched, we reaped some of their catch, it did not look hard. So on our way north we past a house that had a sign that said ‘Fishing Nets for sale’, so we thought there would be no harm in investigating. 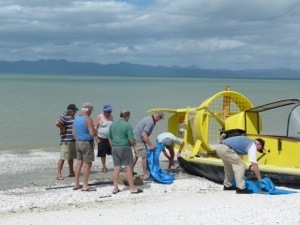 To cut a long story short, we are now the proud owners of a 26m flounder net. We also managed to procure an anchor and a buoy, with lots of instructions on what to do, how, the rules, and lots more information. We bought another anchor and fashioned another buoy using empty milk bottles, marked them with our name and phone number (who knew that naming them was a requirement). The net is made from very fine filament and has a lead weighted line along the bottom with small floats interspersed along the top line. Hence we are back at ray’s Rest trying our hand at flounder fishing. We attached the anchors to each end of the net, affixed the buoys, then sought some experienced advice from others here fishing. A lovely couple came along and helped us set out our first net. net placed on sand ready for the tide to come in. High tide was in the early hours of the morning, so we had to get up at 5.30am to check the nets. Now anyone who knows me really well will know how much I hate getting up in the mornings, especially at silly hours! But without a grizzle I was up and on the beach by 5.30am. Would our net still be there? Would we catch any fish? Well, yes we can catch fish!! And here is the proof. 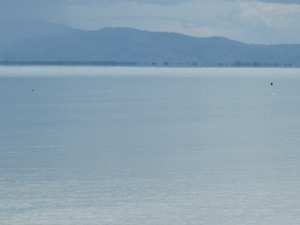 We set the net out ready for the next high tide, here it is waiting for the tide to come in….can you see it? you can see the buoys lying in the sand waaaaaaay off in the distance. 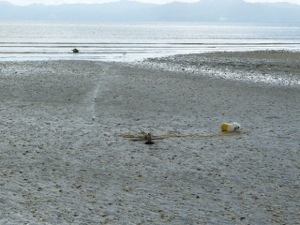 covered by the tide, black buoy on the left, with 4 white small floats leading across to the milk bottle buoys on the right. What will be in this catch we wonder? We have just been and collected our catch and retrieved the net and all our gear. 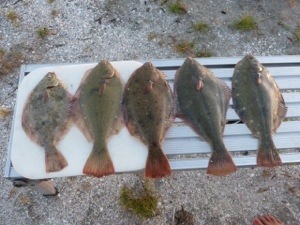 Another four flounder. 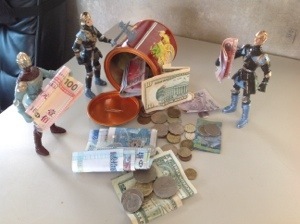 Yay…..guess what’s for dinner? 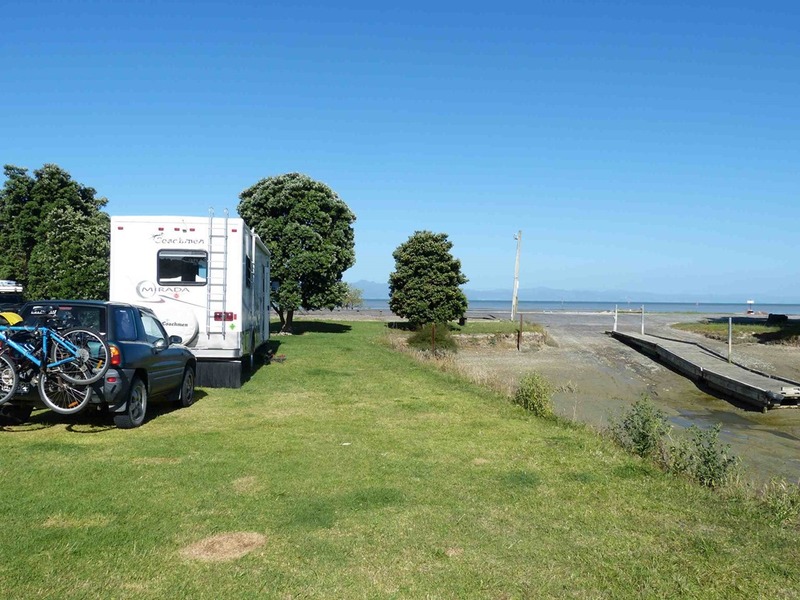 Parking at ‘Ray’s Rest’ north of Miranda, south of Kaiaua on the Firth of Thames, is always pleasant especially being so close to the sea, at full tide that is. At low tide the mud flats stretch as far as the eye can see which provide great feeding for birds which is why it this area is called the Seabird Coast. Sunday afternoon and Bill & Estelle and Ron & Jan came to join us for a fish & chip lunch from the renown Kaiaua Fish shop. Although the weather was not terribly pleasant, it was certainly warm with a very fine misty drizzle which just made it a very humid day. 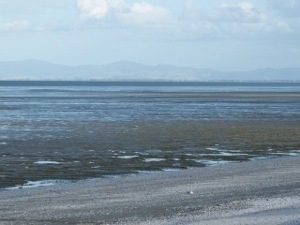 But it did not deter us from a walk along the beach. After lunch and a long natter, Roy & I joined Ron & Jan for a quick trip down to Ngatea to a blueberry farm. We all bought a plentiful supply of the berries, most of mine are destined for the freezer for use later in the year, as well as indulging in a fresh blueberry icecream. Delicious. Whilst at Ray’s Rest we have been “Vannini-fishing” again. 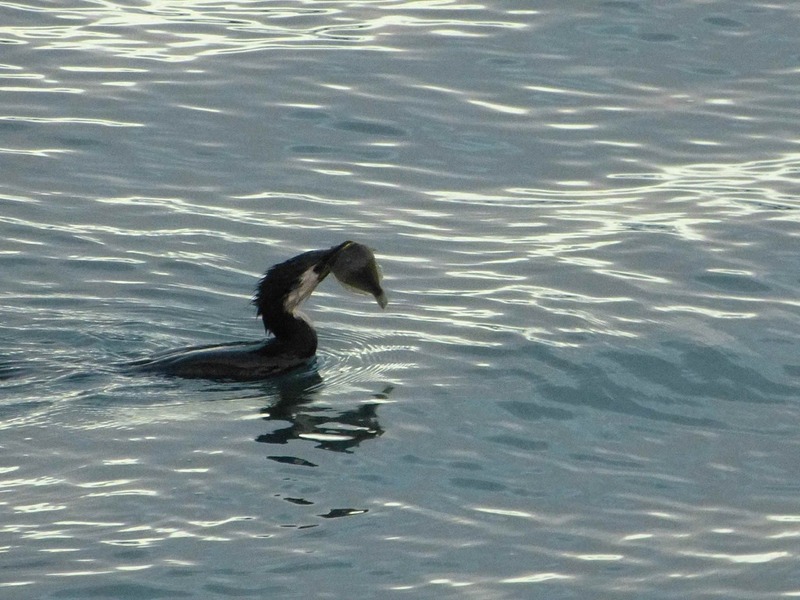 That is to say, Roy goes off on one of his wanders and comes back with some fish kindly donated by fisherman! 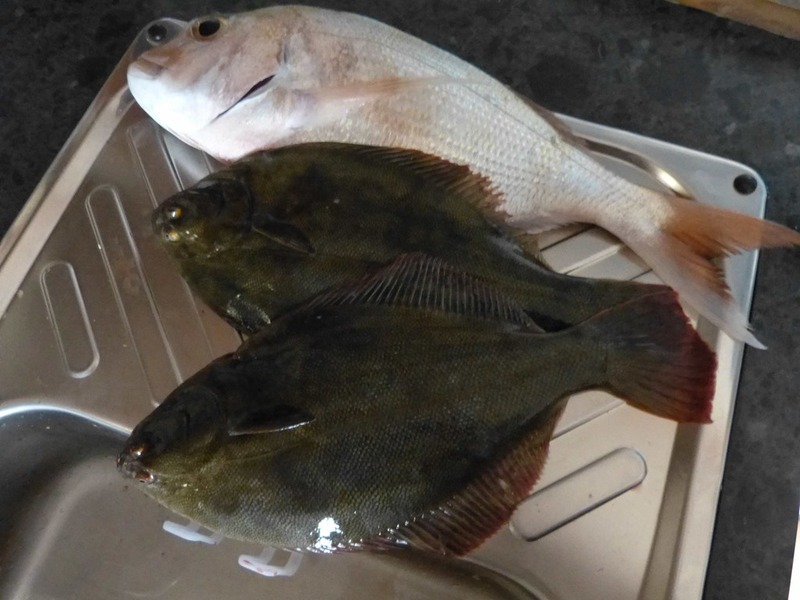 This time we were given two lovely flounder and a snapper. After our fish & chip lunch we were so full that we did not really need anything else to eat. The snapper was filleted and put into the freezer for later, and the flounder are destined for our plates tomorrow evening. Monday morning and it was time to pack up and move on, we had planned to head to Waharau Regional Park, just 13kms away. 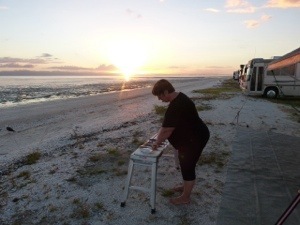 However, we had a brief stop in Kaiaua (5kms away) and ended up staying at the Kaiaua Boat Club for a couple of nights. 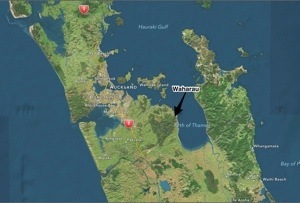 The explanation for the stop in Kaiaua will be explained in a later blog entry! 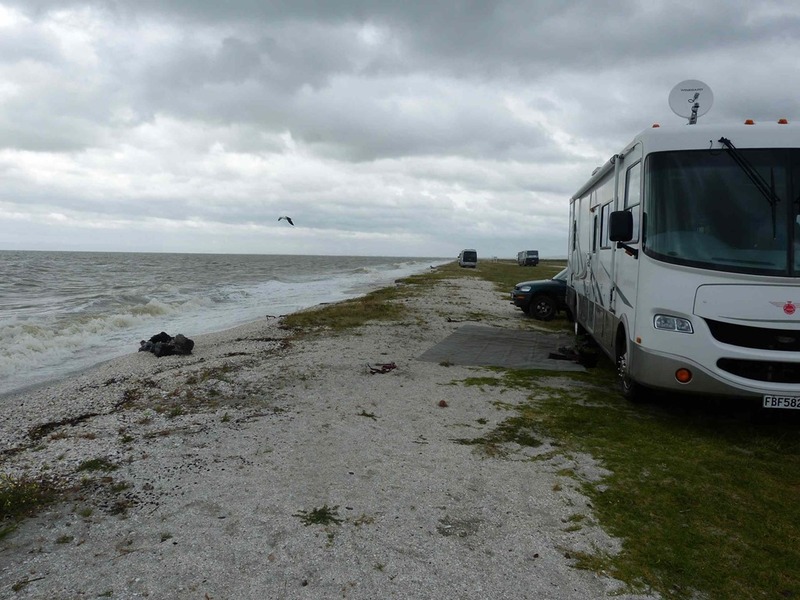 A stunning spot for a couple of nights, tomorrow (Wednesday) we will head off again but in which direction we are not sure of as yet, it depends on the wind! PS. The flounder were deliciously sweet and tender.Yum! 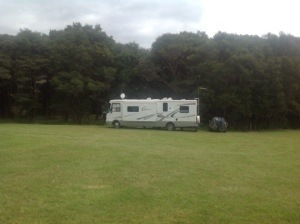 Although we have been in and around Auckland for a couple of weeks now, we have not ventured too far from our van base. Whilst at Ardmore we forgot to take any pictures of us parked up, slack I know. 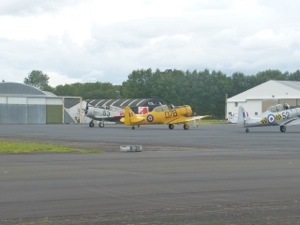 But we did manage to take a couple of pictures of a group of planes that were practicing flying in formation, again we missed the opportunity to take photos of them in formation but we did manage to take a few pics of them on the ground. 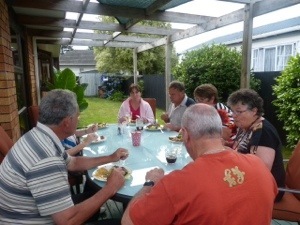 Between Christmas and New Year, we organized to host a BBQ at the van for Roy’s mates from his school days. The day dawned cloudy and windy with the weather forecast for it to become rather nasty later in the day. 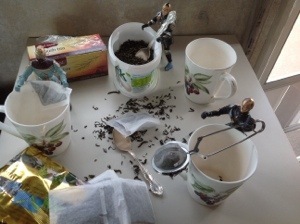 Oh dear, what are we going to do? Antony had offered us the use of his place in case of inclement weather, he lives just a few minutes from Ardmore so we made to decision to move. Everyone duly arrived at Antony’s, we had a lovely meal, then we spent the rest of the evening, talking, laughing and playing a few quizzes. Estelle, Bernice and Janet were to meet up again the following day to head to the movies to see Philomena. A fantastic movie staring Judi Dench, which tells the true story of Philomena Lee’s 50-year-long search for her son. We can highly recommend this as a good movie to go and see. In our usual fashion we saw the New Year in from the insides of our eyelids, not particularly exciting we know but we had had a full on day. New Years Eve, Roy went out for a days fishing with Bill P and Bill V out towards Waiheke island and although they had a good day out and lots of fish were caught, none were of a decent size to bring home. Meanwhile, I spent the day catching up with the laundry at Ants, then headed out to the shops before treating myself to a pedicure before heading back to the van to spend the afternoon sitting in the sun catching up with Jacky. 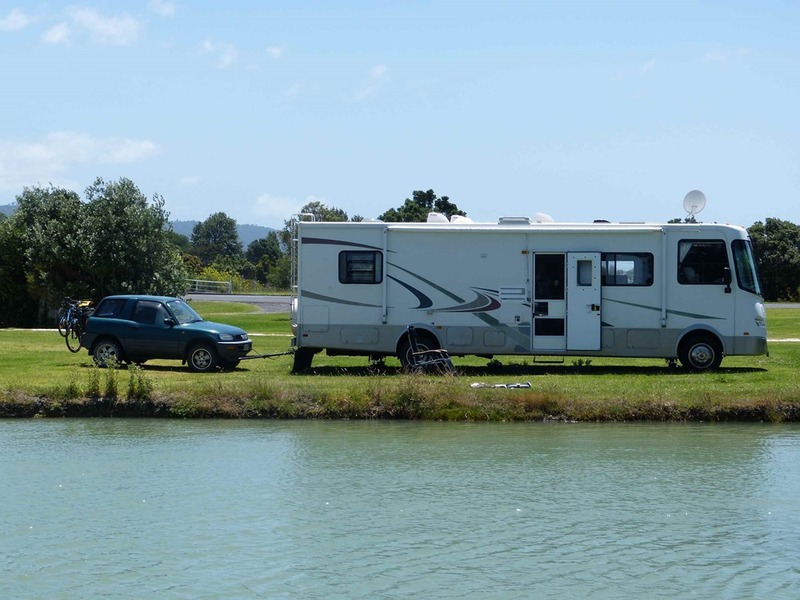 We thought it was about time we moved from our comfortable spot at Ardmore thus we headed off on New Years Day, travelling the huge distance to park at the Papakura Club, all of 10Kms away. But first we had to visit the dump station just 2kms away. Off in the rain we headed to Bruce Pullman park where we knew there was a fantastic dump station…..yes, we do rate dump stations! !…..however, when we arrived at the park, the gates were locked. Damn, a change of plan, so off to find the next dump station which was in Drury. That done, we found our way to the club and found a good spot to park. 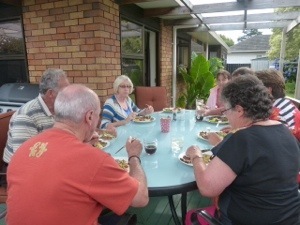 Again we caught up with Ron & Janet, Bill & Estelle and Bill & Linda when they came to the Papakura club to join us for dinner on Thursday night. Friday and it was back to annoy Ants and use his washing machine, although I did earn my keep and ironed his shirts….all 17 of them! Saturday and we picked up Ants and headed into town to have lunch with Roy’s eldest son Simon and his wife Anita. It was good to catch up with them in between their busy work lives and tennis watching duties – Simon is chairman of the board of Auckland Tennis this year. A lovely time was spent with them before we headed off back to the van. 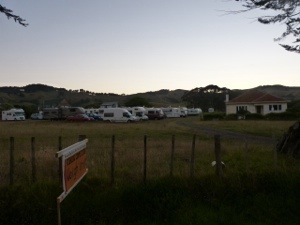 Saturday and we decide its time to move on, this time we are heading across Kaiaua way but first it’s back to the dump station where this time there are no locked gates. 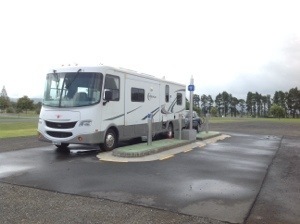 From there it was onto the motorway, with a quick stop at the petrol station on the way before turning up at the Shellbank at Kaiaua where we are comfortably parked for a couple of days, with just a couple of other motorhomers!